The Chatham Anglers (18-16-2) have inched closer to clinching a playoff spot with three wins in their last four games. Despite allowing nine or more runs in three of those four contests, the A’s offense has been explosive enough to overcome poor defense to remain in control of the two-seed in the East Division. Chatham currently sits in second in the East, trailing the first-place Yarmouth-Dennis Red Sox by four games and leading the third-place Harwich Mariners by two games. 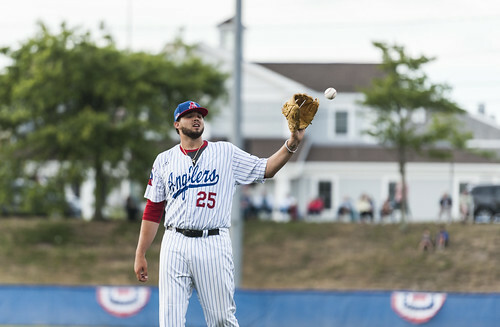 With eight games to go in the regular season, the Anglers will hope to clean up their defensive outings while maintaining offensive firepower in the lead up to the playoffs. How have second-year CCBL players improved or regressed compared to their performances last year? David Schneidman: While just one position player — Ashton McGee (North Carolina) — from last summer’s Chatham team remains on this season’s roster, the A’s boast two more hitters — Blake Sabol (Southern California) and Drew Mendoza (Florida State) who played in the Cape League last season. Mendoza and McGee have seen reduced playing time from a year ago. Mendoza, who played for Y-D last summer, had 82 at-bats in 28 games (2.9 per game) in 2017 versus 61 at-bats in 26 games (2.3 per game) in 2018, result of solely playing as a designated hitter this year. Despite a similar batting average and hitting totals, Mendoza has put together better at-bats this summer. Through 26 games last season, Mendoza had struck out 31 times and walked three times. This year, he has gone down on strikes just 20 times and has taken eight free passes. All of McGee’s numbers are down as he is on pace to record half the amount of at-bats he registered last summer, partly due to arriving to the Cape a week later than he did in 2017. But, similar to Mendoza, he has axed his strikeouts and found other ways to contribute. Of the eight times McGee has been on base, he’s come around to score in three of them. Sabol’s numbers have shot up in every category as the utility man has been one of Chatham’s best players this season. Playing for the Wareham Gatemen last year, Sabol batted .177 with 20 hits and two homers. In 35 fewer at-bats so far this summer, Sabol has 26 hits and seven home runs, earning him an All-Star selection and invitation to the Home Run Hitting Contest. Peter Warren: Four pitchers on the Chatham staff — Jeff Belge (St. John’s), Austin Bergner (North Carolina), Dan Hammer (Pittsburgh) and Spencer Van Scoyoc (Arizona State) — are back on the Cape for a second summer. It has been been a mixed bag for these four hurlers. The difference between Hammer in 2017 and Hammer in 2018 has been night and day. In six starts and one appearance out of the bullpen in 2017, Hammer had an ERA of 9.00 and WHIP of 2.09. He allowed three runs or more in four of his seven appearances. This summer, Hammer was the starting pitcher for the East Division in the All-Star Game. He has a 2.16 ERA, 1.00 WHIP and has not allowed a run in four of the six games he has pitched. Belge’s numbers from 2017 to 2018 are very similar. His regular season ERA is 0.02 points lower and his WHIP is 0.01 points better this summer. The big difference is how the southpaw is being used. In 2017, Belge pitched in seven games, six of which were starts. This year, Belge has also pitched in seven games, but only three have been starts. Much like with the other returners, Belge has been doing a much better job punching out opposing hitters. Belge has 37 strikeouts this summer — the third most in the league. He struck out only 24 batters last year. For Bergner, it is difficult to look at the raw numbers. His ERA (3.24 compared to 1.25) and WHIP (1.32 to 1.19) are all worse in year two than in year one. But, Bergner was in Chatham for most of the 2017 season. This summer, he arrived on the Cape in July because of the College World Series. He has only pitched in three games in 2018 after pitching in eight last summer. A deeper dive shows Bergner is still pitching very effectively. He is striking out over 11 batters per nine innings, his stuff looks good and has picked up two victories in three games. Van Scoyoc is the one pitcher who is dealing with the sophomore slump. For the Yarmouth-Dennis Red Sox in 2017, he made six starts in seven appearances and finished with a 3.11 ERA, 1.23 WHIP and .217 batting average against. This summer, Van Scoyoc has a 6.75 ERA, 1.63 WHIP and .254 batting average against in eight outings, seven of which have come out of the bullpen While the southpaw has struggled in year two, he is doing one thing better — striking out batters. Van Scoyoc has 20 strikeouts in 16 innings this year, compared to 20 K’s in 26 frames last summer. Chatham has scored 50 runs in its last six games. What spurred such an offensive explosion? DS: Over the past week, the Anglers have used contributions from a multitude of players to score runs. Thirteen different A’s players have driven in at least one run in Chatham’s last six games. While the return of Spencer Torkelson (Arizona State) — who has nine hits and seven RBI since returning from Team USA — has been an important development in the team’s recent success, improved at-bats from those who previously struggled to get on base have arguably been more crucial. Jorge Arenas (Stetson) has altered his performance the most. The Florida native went on a four-game multi-hit streak from July 17 to 20, improving his batting average from .186 to .250. But the newfound threats in Chatham’s lineup do not stop there. Colin Simpson (Oklahoma State) has recorded a hit in 11 of his last 12 games after tallying just nine base knocks in his first 22 appearances. McGee has struck out just once in his last 10 at-bats and has put the ball in play, including two hits, two RBI and two runs scored on July 19 at Brewster. PW: The over-the-fence power has been on display all season from the Anglers — Chatham leads the league in home runs and has two of the top three individual leaders. However, the gap-to-gap power has not been seen consistently until recently. Chatham has hit 13 doubles in the past six games, the second-most in the league in that time frame. The 13 doubles account for more than a quarter of the team’s output this season. It is not just that these doubles are being hit, but they are being hit in key situations. Arenas had two RBI doubles on July 17 against Brewster that helped Chatham stay in the ballgame. Against Cotuit on July 20, Torkelson knocked a two-RBI double in the fourth that cut the Kettleers’ lead in half and Sabol roped a two-run two-bagger to cut Cotuit’s lead to one in the seventh. After losing three-straight from July 15 to 18, the Anglers have won three of their last four. What changed? PW: The old adage goes “It’s not how you start, it’s how you finish.” For the Anglers, the start usually indicates whether or not Chatham will win or lose the game, especially from the pitching staff. When the A’s score first, they are 13-3-1. The four losses in the last seven games all feature poor performances from the starting pitcher. In those four games, only one starter — Jeff Belge (St. John’s) against Y-D on July 15 — lasted more than two innings. In total, the four Chatham starters in those four losses threw 8.2 innings, gave up 18 hits, 18 earned runs and walked 11 batters. In the three wins, the starting pitchers — Austin Bergner (North Carolina), Dan Hammer (Pittsburgh) and Alek Manoah (West Virginia) — were all solid or better. The group threw 15 innings, gave up 18 hits, allowed eight earned runs, walked five batters and struck out 19 hitters. When the team gets a quality start from the pitching staff, it allows their offense to find its grove and not press. The offense, as we have seen over the last few games, is going to score runs. But when they face big deficits every other day, it is not smart to say the offense will always be able to makeup the deficit. The Anglers released three players in the past three days. Who were they and what was their impact during their time on the Cape? DS: Three players — Troy Miller (Michigan), Rankin Woley (Auburn) and Davis Daniel (Auburn) — were released by Chatham in the last three days. Miller, who was one of the A’s six All-Star selections, signed a professional contract with the Toronto Blue Jays, prompting his release Sunday. During his tenure in Chatham, he was one of the league’s top relief pitchers. Miller boasted a 1.14 ERA with 23.2 innings and 29 strikeouts under his belt. He tossed five hitless outings, four of which lasted two innings or longer. Woley, who hadn’t played in 10 days due to injury, was a solid piece off the bench during his time on the Cape. He contributed five hits, including two doubles, in 23 at-bats for the A’s. Woley’s departure signifies the loss of a multi-positional player, something Holliday took advantage of during his tenure on the Cape. Even though Woley never lifted off at the plate, he provided decent at-bats and finished with a .217 batting average. Daniel hadn’t pitched since July 11 before being officially released Tuesday morning. Aside from allowing four runs on seven hits against Wareham in his most recent appearance, Daniel had been lights-out all season. The right-hander hurled three scoreless starts, each lasting 3.2 innings or longer. He held opponents to a .164 batting average in four appearances while striking out 15 batters.